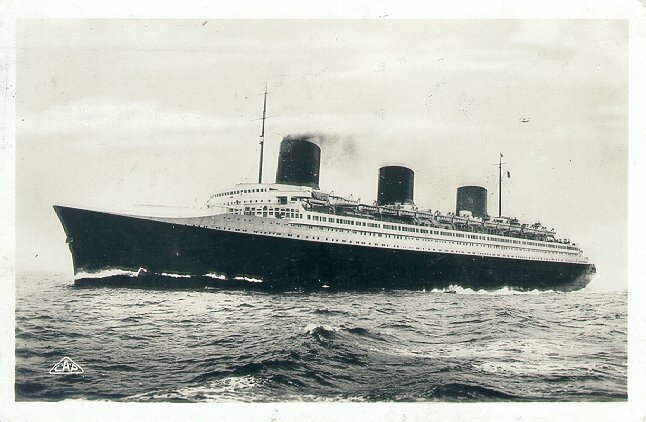 The S/S Normandie was the masterpiece of CGT French Line and is often acclaimed as the ultimate ocean liner. She was launched in 1932 to great acclaim and immediately became the largest ocean liner in the world and on her maiden voyage claimed the coveted Blue Riband for France. In the years that followed she had a fierce rivalry with Britain's great RMS Queen Mary. Sadly in 1939 the Second World War began and this halcyon era of ocean travel was abruptly brought to a close. She arrived in New York and was laid up awaiting her future. Eventually with the fall of France she was requisitioned by the United States and converted into a troopship. But sadly during conversion she caught fire and due to the incompetence of the US Navy and the volume of water poured into her, she capzised at her berth in New York. Her hulk lingered on through the war years as everyone wondered what to do with the remains of this once beautiful transatlantic masterpiece. Eventually it was decided that she would be scrapped and in 1947 she was towed away for scrapping by the Lipsett Corporation in nearby Newark. Thus ended the career of the most iconic of all ocean liners and a timeless legend. A ship of the beauty of the great Normandie will never been seen gracing the world's oceans again. She was a true transatlantic masterpiece and certainly deserves the title of "The Most Beautiful Ocean Liner in the World". Long may the memory of this most beautiful of all ships continue to endure.